Here is a photo of Langosta Beach on the stretch between our condo and the Sueno del Mar Bed and Breakfast that I have showen during the past few weeks. It is a nice walk to breakfast. After showing the photo of our condo from the beach yesterday, today I am showing a photo of the front of our Langosta condo, with tropical flowers filling most of the frame. We have photos of the doorways of ancient temples of Cambodia posted on our Viva la Voyage travel photo site this week. I have shown photos of the Sueno del Mar Bed and Breakfast for the last couple of weeks, even though it is technically a bit of a competitor of mine, as there may be some people who decide between renting a condo or staying in a bed and breakfast. So, having featured and promoted a competitor, I think it is fitting that I would post today a photo of our condo on the beach in Playa Langosta. Our condo is on the second floor of this beachfront building right in the center of this photo. The tree trunk on the right will fall down sometime, and probably later become driftwood. I think I will miss it, as it is a familiar sight. This is the end of my little series on the Sueno del Mar Bed and Breakfast. Yesterday I showed the sign from the road. Today I am showing the sign from the beach. I think that the beach is a better place to advrtise their breakfasts, as probably there are more people in the mood for a relaxing breakfast who walk along the beach rather than walking along the road. After all, Julie will often say, "Let's take a walk on the beach." I don't think I can remember her saying, "Let's go for a walk along the road." This is the sign on the front wall of the Sueno del Mar Bed and Breakfast, a fw doors down from our Langosta Beach condo. This logo captures the spirit of the beach front location, except the sun always drops below the horizon behind the ocean rather than in front of it, but who would be hyper-technical when it coms to relaxation on the beach. Yesterday I showed the view towards the lobby of Sueno del Mar Bed & Breakfast. Here is a view of the lobby area, just outside the office. There is a nice rug that is hung on the wall like a tapestry. I don't blame them for hanging the run on the wall instead of putting it on the floor. With people walking up from the beach with sandy shoes or in from the town with dust, dirt or mud on their shoes, a nice rug outdoors would get dirty and ruined. Yesterday i showed the path to the front gate of Sueno del Mar. Here is a view from the entrance down to the lobby and the corridor where the rooms are located. Merry Christmas to the readers of my website who celebrate this holiday. 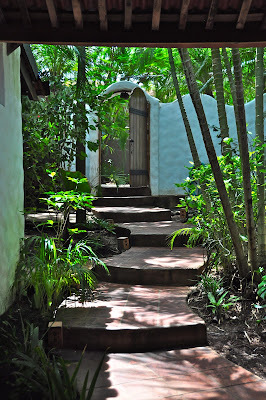 This is the walkway from the lobby up to the front entrance of Sueno del Mar Bed & Breakfast. It is a pleasant walk from here regardless of whether guests are headed to the beach or up this path towards town. 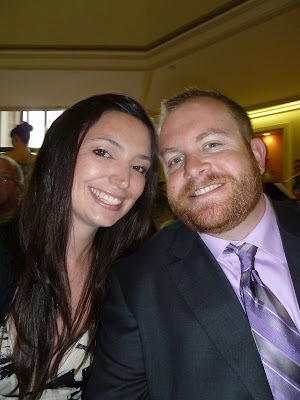 Today my younger son, Stuart, is getting married to Christina, a charming, smart, and beautiful elementary school teacher. This photo of them is from a friend's wedding earlier this year. I hope you will indulge me in this divergence from my usual posts to share these celebratory best wishes for them. There is a Costa Rica connection to this occasion, however. Where do you think Stuart and Christina are headed for their honeymoon? To our Langosta Beach condo in Tamarindo, of course. I am glad that they are able to use our condo for their honeymoon. When my older son got married about a year ago, he asked to use our condo for his honeymoon, but both of our condos were already rented during the period after his wedding. I felt bad, but I couldn't cancel a reservation I had already accepted. Today is Sunday, so we have new photos posted on our Viva la Voyage travel photo site. This week we are showing some of the doorways of ancient temples of Cambodia . I started this series of photos of Sueno del Mar Bed & Breakfast by showing hammocks and lounge chairs on the beach. So I figured I should show a hammock by the pool, which I guess is for people who are tired of the hammocks by the ocean. Tomorrow I will digress from my normal posts for some personal news. We have photos of our recent trip to Papua New Guinea posted on our Viva la Voyage travel photo site this week. If you borrow a book from the bookshelf, or bring some beach reading of your own and have had enough sun, here is a pleasant spot to relax, do a little reading, maybe have a drink and some quiet conversation, or take a little snooze, at the Sueno del Mar Bed & Breakfast. 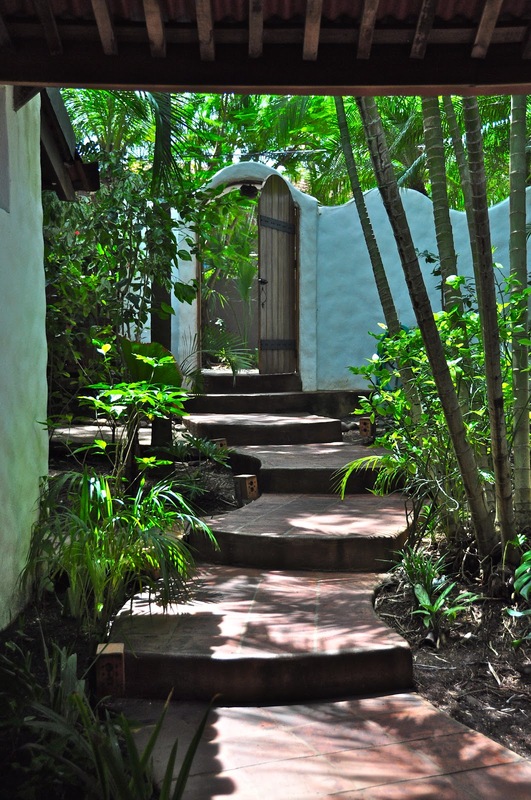 The Sueno del Mar Bed & Breakfast has a courtyard with tropical plants and trees. This covered patio patio area has a rocking chair and book shelves with a little library. Tomorrow I will show you another pleasant spot for reading one of the books. After I took the photo I showed yesterday of a planter next to the door of one of the rooms at the Sueno del Mar Bed & Breakfast, we walked by another room that had an open door because it was apparently being cleaned to be ready for a new guest after the other guest had checked out. This let me take a quick photo looking into the room The rooms looks nice, and in keeping with the Spanish colonial atmosphere of this little beach resort. 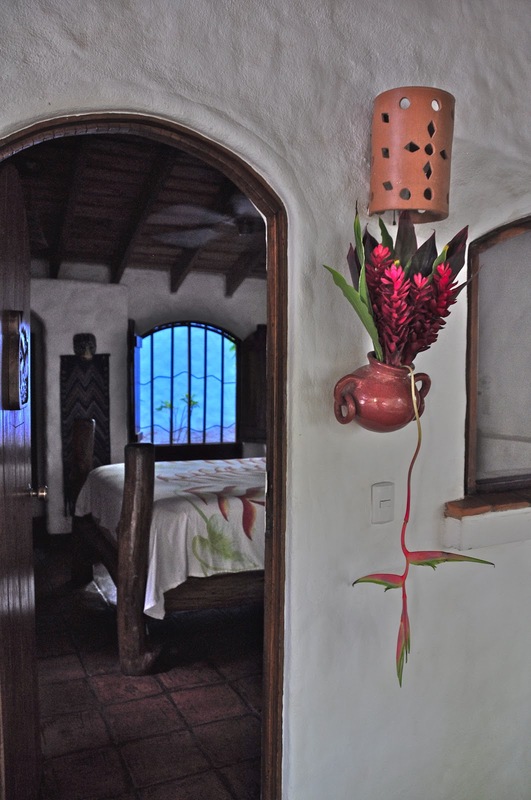 The rooms at the Sueno del Mar Bed & Breakfast have usual planters hanging next to the doors. They have ginger plants frowing up, and heliconia plants hanging down. I have never seen this arrangement before, but it does make for a unique tropical welcome back to one's room. I have shown photos of the breakfast and the various ways to lounge on the beach at the Sueno del Mar Bed and Breakfast, so I figured I should show a few more photos of the place. This is a photo of the main corridor of the B & B. The rooms are arranged around this little tropical courtyard. I will show more photos of this little resort during the next week. Yes, the magpie jay that landed at the table next to us did help himself to some leftovers of the breakfast fruit. This photo shows his long tail and the distinctive top not on his head. Blue jays in the USA are known for robbing the food of others. It is interesting that their cousins in Central America share this same trait. As I have mentioned before, tiny Costa Rica, which is the size of West Virginia or Switzerland, has more species of birds than the USA and Canada combined. One of my guidebooks describes it as Nirvana for birders. Today is Sunday, so we have photos new photos posted on our Viva la Voyage travel photo site. This week we are showing some photos from our recent trip to Papua New Guinea. It took the Jay no time to move from the back of the chair in yesterday's photo to inspect the food on the plate of leftovers left for him. These magpie jays eat fruit in the wild, so it is a convenience for them to eat fruit already cut up on a plate. We have photos of Julie's Grand Canyon rafting trip posted on our Viva la Voyage travel photo site this week. My guidebook on Costa Rican birds says that the white-throated magpie jay's habitat is the lower elevation dry forest and savannah areas of Costa Rica's north Pacific slope. That certainly describes our area. They are distinctive because of their white breast, a dark ring that looks like a necklace, and a curled crest. The guidebook also says that these jays are somewhat aggressive. That is probably true of all jays. Aggressive means that they are not afraid to approach possible food sources even if they are in proximity to people. This bird perched itself on the back of the chair at the next table, but it was obviously interested in breakfast. Did Georgia O'Keefe Eat Here? This cow skull looks like something Georgia O'Keefe might have painted. It is on the wall of the outside dining area at the Sueno del Mar Bed & Breakfast. Tomorrow I will show you the unusual guest who grabbed a chair at the table next to us. A tease is that she had a very elegant, dark necklace. In tropical Costa Rica, where bananas, papaya, mango, pineapple and other fruit is grown, breakfast should include fresh fruit. This photo is the fruit serving at Sueno del Mar Bed & Breakfast. My mention of bananas gives m an excuse to explain that Costa Rica was the original "Banana Republic." In the late 1800's, the country wanted a railroad built from the central valley where most of the people lived to the Caribbean coast, which would provide access to ship products to foreign markets. Lacking the funds for such a large project, they used the same method as the USA did for building railroads. They granted rights to build a railroad to a private company that included large land grants on each side of the railroad right of way. An American company got the contract, built the railroad, and decided to plant bananas on the land to have a product to ship on the rail line. The company became what is now United Fruit Company, marketers of Chiquita bananas. The banana industry had a profound impact on the country. Jamaicans were brought in to build the railroad, and their descendants continue to live along the Caribbean coast. At one point the company ended all banana cultivation on the Caribbean side of the country and moved to the Pacific side to thwart labor union activity. The political aspects of what is sometimes considered to be a "Banana Republic" was curtaild with Costa Rica's emergence as a stable democracy in 1949. Yesterday a reader asked in a comment whether we had pancakes for breakfast when we walked down to the Sueno del Mar Bed & Breakfast for breakfast. Here is a photo that shows the affirmative answer to that question. As a Bed & Breakfast, there is not a menu like a restaurant, and the offerings for breakfast change. But the breakfast offerings are predictably delightful, and a perfect way to end a walk on the beach. After a walk down the beach to the Sueno del Mar Bed & Breakfast, we take this little path from the beachfront area to the area where they serve breakfast. I will show a few more photos of this experience in the days ahead. After hammocks, Adirondack chairs, and a day bed on the beach, that I have shown the last three days, I guess normal beach lounge chairs look rather ordinary. 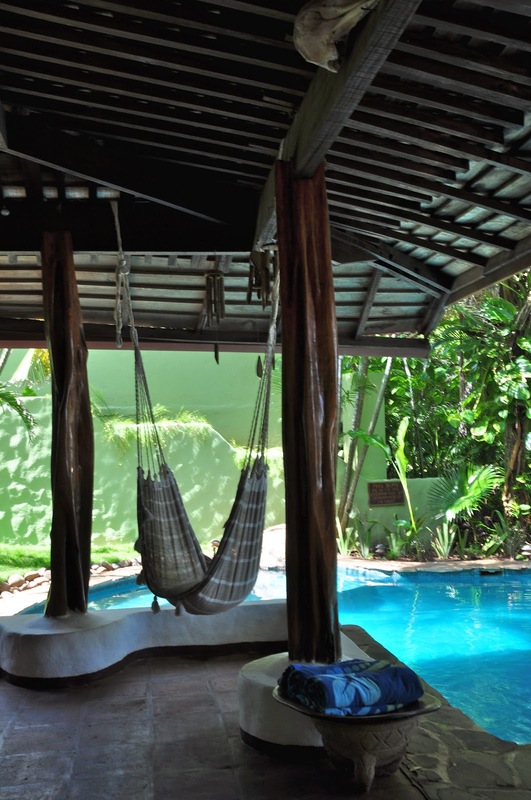 Guests at the Sueno del Mar Bed & Breakfast have at least 4 choices of how to relax on Langosta Beach. That tough decision must be the most stressful part of their day. It makes sense. Sueno del Mar means dreams of the sea. In guests are supposed to be having ocean dreams, there must be some relaxing and napping going on. Today is Sunday, so we have new photos posted on our Viva la Voyage travel photo site. This week we are showing a few more photos of Julie's unique Grand Canyon rafting trip. The last two days I have shown hammocks and Adirondack chairs on the beach, so today i am showing a day bed on the beach, also on the grounds of the Sueno del Mar Bed & Breakfast. I guess if a hammock is not good enough and someone wants a real power nap, this might be the spot. This week we have photos of the recent total solar eclipse off the coast of Australia posted on our Viva la Voyage travel photo site. Yesterday I showed some of the hammocks at the Sueno del Mar Bed & Breakfast. If guests get tired of lying in a hammock, they can get up and relax in these Adirondack chairs on the beach. Life is tough. Such difficult choices. Hammock or chairs? And there are more choices, as I will show in couple of upcoming posts. How would you like to relax here? What could be better than a little nap, or time to rad a book, in a hammock in the shade under the trees on the beach, while listening to the nearby waves and being cooled by breezes . These hammocks are in back of the Sueno del Mar Bed and Breakfast, located on Langosta Beach a few doors down from our Langosta condo. We sometimes will walk there for a hearty breakfast. This is another example of a typical rural house in our area of Costa Rica, which I have called a Tico house. I like the lush landscaping. Tico is a term used to mean Costa Ricans. It is not derogatory. 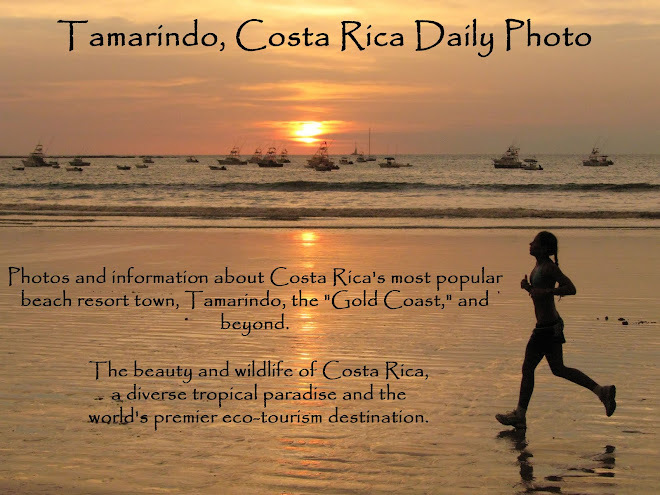 Costa Ricans us the term all the time to refer to themselves. The cable company is called Tico Cable. The leading English language newspaper is called the Tico times. Th term is derived from a quirk in the way Costa Ricans speak Spanish. They like to use the suffix "ico" for the diminutive form of words. I think this is a type of heliconia flower. We are in our Scottsdale, Arizona house right now. 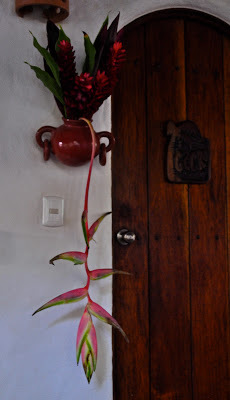 We had a group of friends over for dinner on Sunday, and I bought a large tropical heliconia arrangement for our kitchen, which makes us miss our Tamarindo, Costa Rica condos and puts us in the mood for another stay down there. Yesterday I showed a photo looking out to the peninsula of Playa Flamingo. This is a photo looking south down the coast of Flamingo Bay. The area is very scenic, although these beaches are not suitable for surfing because the waves are gentle in the bay. There are houses perched in the hills to take advantage of the views, as you can see in this photo. There is also a high end condo development going in that advertises beachfront condos for about $1 million USD. That is as expensive as I have seen in the area. This is a view across the bay at Playa Flamingo to the peninsula where hotels and condos are located. Several years ago there was a proposal to build a cruise ship terminal here, as this is the best harbor in the area. There is not really much of a town here, and the area would be overwhelmed by large cruise ships. After the government selected the winning developer for the $90 million USD development, the losing developer sued, the project was delayed, and then the worldwide recession occurred and the project is dead, at least for a while. Today is Sunday, so we have new photos posted on our Viva la Voyage travel photo site. This week we are showing photos of the recent total solar eclipse that we saw off the coast of Australia about 3 weeks ago. It was a spectacular sight. The worldwide Daily Photo Theme Day for November 1 is "My Street." This is a photo of our street connecting Playa Langosta to Tamarindo, taken during the night during the tim when crabs come across to mate or do whatever they do on the other side of the road. I had a choice of whether to show condos, gates to beachfront mansions, flowers, monkeys on our street, or this crab. It was a tough choice between a monkey or a crab, but I thought this street-level view was more consistent with the theme.